An independent report has identified failings by the Metropolitan Police in investigating the harassment of a girl who was later stabbed to death. 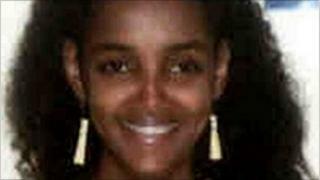 Arsema Dawit, 15, was stabbed more than 30 times in Waterloo, central London, by ex-boyfriend Thomas Nugusse in 2008. She had complained to police that Nugusse had threatened to kill her. The Independent Police Complaints Commission (IPCC) said more could have been done but no-one was to blame for the death. Nugusse, 22, and Ms Dawit had been in a relationship for two years but his behaviour became too much for her and she ended it. On 30 April 2008 Ms Dawit, accompanied by her mother and cousin, attended Kennington Police Station in London to report an incident of assault and threats to kill made by her ex-boyfriend. Ms Dawit was killed on 2 June in the elevator of her block of flats. Nugusse could not be tried because he suffered brain damage in a suicide attempt in prison. On 20 May 2009 an Old Bailey jury was not permitted to return conventional innocent or guilty verdicts and instead found that Nugusse had "committed the acts". Ms Dawit's mother Tsehaynesh Medhani said police had ignored her warnings that Nugusse was a danger to her daughter. An investigation was launched by the IPCC which found there had been "collective and organisational failings". It found that a police station receptionist failed to inform a senior officer that there was an allegation of a threat to kill. The investigation also found that a detective constable, who investigated the complaint, did not conduct an effective investigation and that a culmination of leave, other work commitments and a reliance on a schools officer to make contact with Ms Dawit, meant progress by the officer was slow. IPCC Commissioner Rachel Cerfontyne said: "While our investigation has found that a receptionist and a detective constable could have done more, neither were responsible for what happened to Miss Dawit." The station receptionist later received work performance help and the detective constable was spoken to by a senior officer about the role as an investigator. A spokeswoman for Mrs Medhani said she was "disappointed with the contents of the report which she believes does not go far enough in examining the facts behind the failings identified". She added Mrs Medhani is considering bringing a claim against the police for negligence and challenging by way of judicial review the decision not to hold an inquest into Ms Dawit's death. A Metropolitan Police spokesman said: "This murder was a tragic loss to this family and the MPS offers its condolences to the Dawit family for the death of their daughter Arsema. "As the IPCC report has found, neither of the staff investigated were responsible for what happened to Arsema Dawit, but there was organisational learning from the incidents prior to her death. "We welcome the recommendations from the IPCC and have incorporated the learning into our development programme."